Its been a month or two since I last did a game of the month and thought I'd do something that isn't too old, but its still well worth checking out. Plus its not too hard to find, its usually quite cheap and on a current console. My passion for RPGs is something that is probably quite apparent from the posts on the blog, and this Game of the Month is another one. 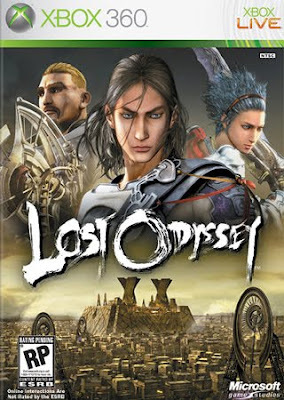 Probably most people have heard of this game, but I know that a lot of people haven't really given it a chance and it has been ignored in many cases, in favour of rpgs from bigger, more reknowned studios like Mass Effect, or Bethesda's Oblivion and Fallout 3 to a greater extent. RPGs haven't really taken off on the 360 despite the couple releases each year, I think that is due to the demographic that plays games on the 360, maybe it is a bit of a stereotype, but I think that the 360 gamers are more keen on action games, hack n slash and shooters(FPS and 3rd person). Hopefully we still see decent RPGs like Oblivion, Mass Effect, Fallout 3 etc being released on the 360, and I hope we still see games like these being released and played. This got released not too long ago, in 2007 in Japan and early 2008 over here and elsewhere. It is from the people who made Blue Dragon-Mistwalker, which wasn't that well received, and from what I've heard, most people prefer this one. So where to start? It is an RPG with admittedly a slightly cliched storyline at times, there is a lot of focus on memories and the main character's past. 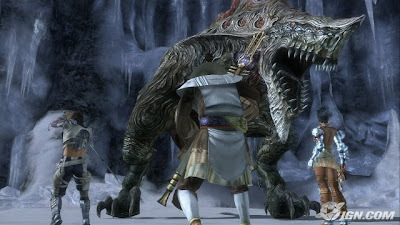 There are a few interesting twists and unique bits to the game though, the main character, Kaim Argonar, is an immortal and is trying to regain his memories. One thing I quite liked in the gameplay was the way that the mortal playable characters that join your party can learn skills by linking to the immortals. You can also learn skills from items obtained as you go through the game. There is a huge amount to find and do in the game. There are a LOT of skills, so it is good for completionists, and anyone else, as you can run through the game relatively quickly if you don't want to go into too much depth. I found myself putting in around 100 hrs before I beat the game, and I didn't download the DLC dungeons, so I can't really comment on that, how good it is or how much material it adds on. Some of the visuals are incredible actually, it does look really impressive. RPGs on the 360 are on the whole really good visually, I loved Eternal Sonata and Mass Effect, despite the numerous texture issues in the latter. So we aren't exactly spoiled for good looking RPGs this generation, but as I've always said, its not the graphics that make the game, they are an added bonus, but I look for a lot of aspects all to jump out at me when I look for games I like. 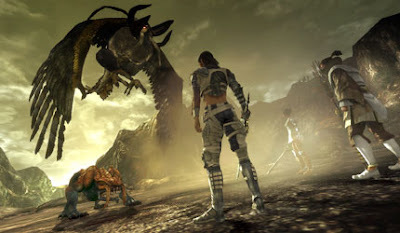 In Lost Odyssey, the story is one of the main selling points, it is really emotionally charged at times, and very well written throughout. One very cool added extra for those who don't mind a bit of reading is the Thousand Years of Dreams. I still haven't read all of these optional bits of story that get added to the main menu so you can read them when you want. If you like to read, you will be impressed by the quality of these bits of the back story of the characters and game. The battle system and gameplay as I touched on earlier, is quite good. Its nothing groundbreaking, but the minor tweaks to the formula of turn based battles and gameplay as a whole keep it interesting. The Target ring system is slightly reminiscent of Squall's gunblade trigger, you have to get your timing right to get a boost to damage and enable some effects from your character's equipped ring and weapon. I quite liked the way they did the row wall system in battle. Depending on the combined current HP of your front row characters, your back row characters will be further protected if the front row is kept well healed, or more in danger if the front row is weakened. Quite a good way of quantifying the protection they get, you can tell how endangered you are. It adds another bit of strategy to it, so you can take this into account when thinking about what moves to make. Turn based RPGs are seen by some as a thing of the past, but games like this I think show they still have a lot to offer. So I would definitely recommend this, it is well worth a look if you haven't played it already. I think it will appeal to people who like their RPGs to have good epic, storylines or if you like a game with a heck of a lot to do, you won't be dissapointed with this one. You can probably pick it up for £10-20 at the moment.